The USA is the land of easy gun access. “We the people” of the USA have been dealing with this for years. I better not hear from a republican candidate who will spout the words after any mass shooting tragedy that this is not the right time to talk about gun control because people need to grieve. We have been held hostage by the NRA (National Rifle Association) which owns the republicans in the US Congress to where not even the most reasonable of gun control measures can be considered for legislation. Yet, we have more to fear from these home grown mass shooters (terrorist events) than we have from the republicans’ bogeyman, foreign terrorists. But in the USA, any individual on a terror list can still purchase a gun. In the USA, there has already been 12 cases of mass shootings already in 2018. In Florida any 18 year old can legally purchase whatever guns and rifles they want, and it is a Parkland Florida High School that has been the latest target of a mass shooter. 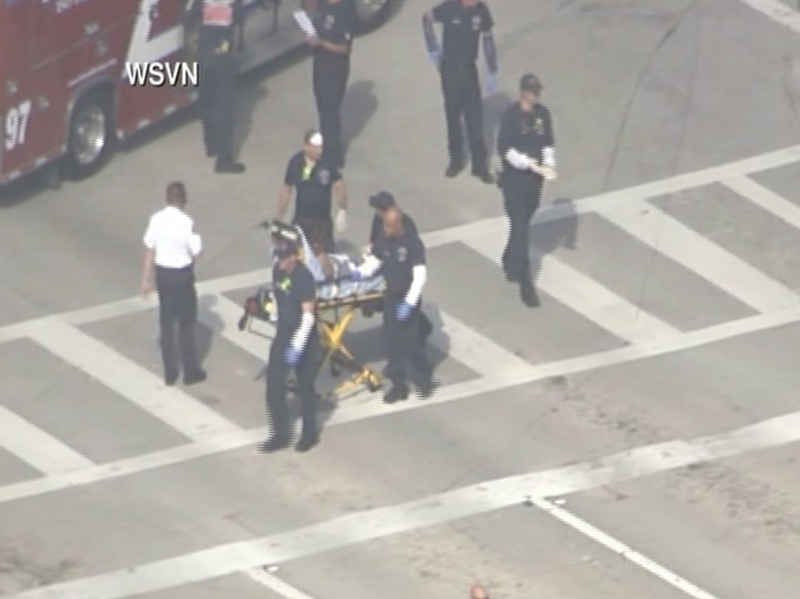 it is being reported that the shooter is in custody, that there are at least 17 fatalities and multiple injuries. 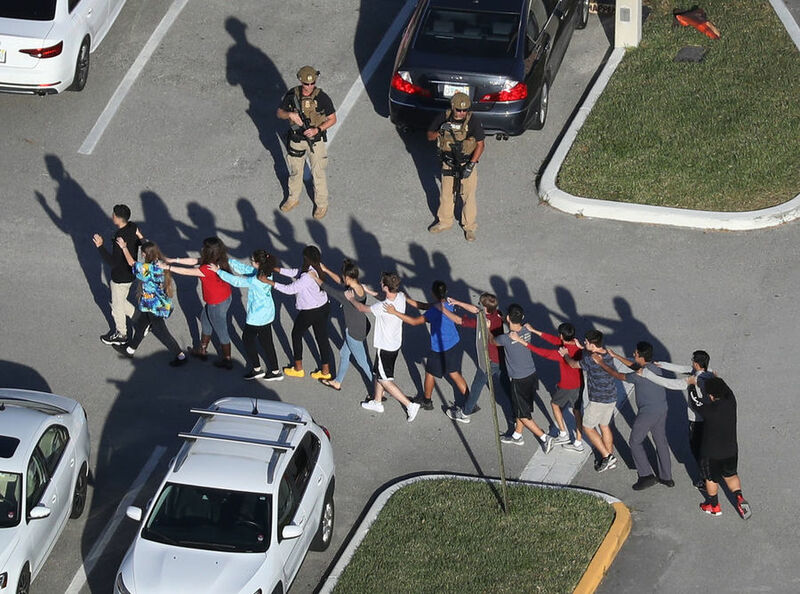 The Marjory Stoneman Dougas High School of 3000 + students was close to the end of a school day when the kids heard the second fire drill of the day, only this second one was set off by the mass shooter. As per a 2/14/18 Miami Herald report, the suspect is a 19 year old ex-student Nikolas Cruz who had been previously expelled. 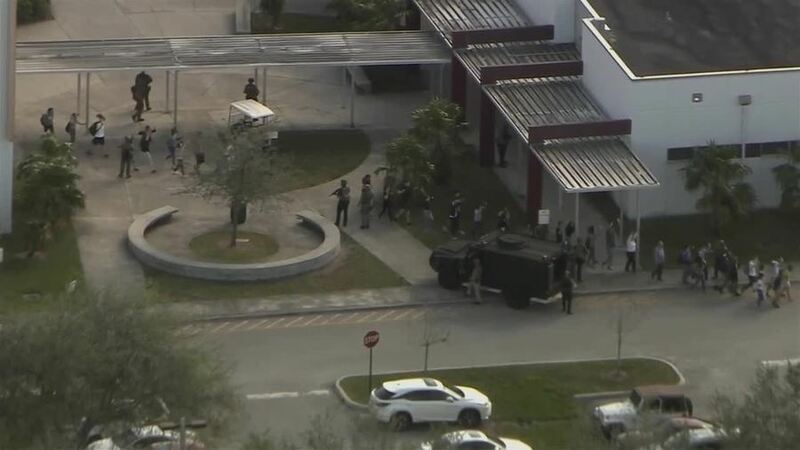 “The former student suspected of opening fire at Marjory Stoneman Douglas High School in Parkland may have been identified as a potential threat to fellow students in the past, according to one teacher. “Nikolas Cruz, was detained by police, briefly taken to a hospital and brought to the Broward Sheriff’s headquarters. 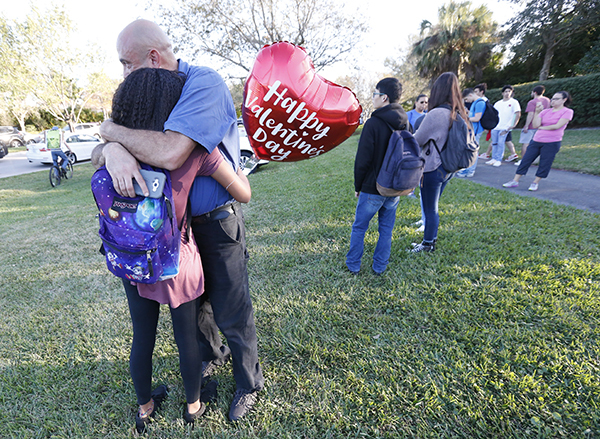 Today, close to Marjory Stoneman Douglas High School’s dismissal, students, staff heard what sounded like gunfire. The school immediately went on lockdown but is now dismissing students. We are receiving reports of possible multiple injuries. Law enforcement is on site. when will Americans sit down and discuss rational gun control? This simply can not be allowed to continue. What will it take for the GOP to do what is right by standing up to the NRA. How do they look at their children and not act. The Republican Congress will come rushing out defending the 2nd amendment because si many are in the pocket of the NRA. Greed over our country and even our children. I hope the first lawmaker who dares to spout this nonsense gets shut down with a few blessed epithets. It’s reported the shooter is an eighteen year old former student Nicholas Cruz…not cage. Thanks a million for the heads-up. You’re welcome. The information is coming in slowly. So heartbreaking. Hugs. I’m so sorry for the students, staff, and families of this school. Absolutely horrifying. This tragedy puts even more pressure on the people to vote Democratic in November and bring in some worthwhile gun control laws. At this point, I don’t have any words that adequately describe my emotions over all of this injustice.What does it take for those republicans in the US Congress to act instead of Kow towing to the power of the NRA (NATIONAL RIFLE ASSOCIATION) like the weenies that they are? How many children do we have to lose. Those republicans who refuse to act are complicit with the actions of this young man. They have blood on their hands. Heartbreaking, prayers going out to the families. I believe these shootings go deeper than gun control. Even if we repeal the 2nd Amendment and confiscated all guns, ppl will still find a way to hurt one another. We need deeper understand of why these mass shootings keep happening, is it pharmaceutical drugs? Gov’t false flags? Or simply human nature? Besides, underground black markets will take the place of gun shops anyway. Look at alcohol prohibition of the 20s and early 30s, look at our current war on drugs… billions spent every year on ATF, jails, more police, more violence, so how’s that working out? Laws can only go so far in controlling human behavior; what we need is more understanding, awareness, cultivating higher consciousness, more love and enlightenment. Perhaps it’s time to try something new, evolve our polarizing black or white thinking. 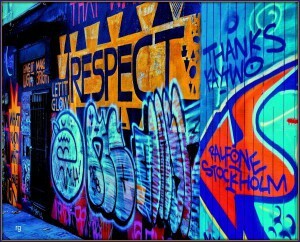 Come together as a ppl, and not divide further apart. Gov.Scott and Sen Marco Rubio received over a million dollars from the NRA last year. They and other republican cowards are doing all they can to make it easy for people to purchase assault weapons in Florida , even 18 year olds. Their concern is with power and party, Tonight Rubio says it’s too soon to talk about gun control once again. Shame on all of these Rep. power hungry cowards and their supporters, there is blood on their hands, the blood of school children . I wonder how they will sleep tonight or look at themselves in the mirror. A very astute point you have brought up. Politicians are part of the symptom, like the NRA, the gun manufacturers, the whole gun culture. But they are not the underlying cause of mass shootings – man’s inhumanity toward man. Yes i agree, shame on our “representatives” for selling us out. Allowing loose gun control laws under the guise of upholding the 2nd Amendment is criminally negligent and irresponsible legislation. They should be held accountable for accepting blood money, a clear conflict of interest which does not benefit the ppl they supposedly represent. It is painfully clear where their allegiances lie, and we the ppl have the responsibility to vote them out! I am out of tears. It seems I go from the crying stage to being enraged within minutes. This is an outrage. I did not grow up with guns but I did have rifle training as a kid while my Dad was in the military. I’m agree with the 2nd amendment. But an AK47 is not a weapon required for hunting or for protection. There is no reason for these weapons or any mechanical gadget that can adapt a rifle to be automatic, to be available for sale on the open market. There needs to be background checks on everyone and better follow-up care on troubled youngsters. This was a lost difficult child who had lost his Mom, this past November, and his Dad in 2004. It seems that in the home where he lived, he was allowed to own this AK47. He fell through the cracks and innicents paid the price. Will the same inaction happen under the Democrats, will the NRA be offering gifts, bribes or even threats to have their Senators etc in their pockets. Major changes didn’t happen last time they were in power, small ones are no longer enough. My thoughts are with the families and the victims of this latest incident. The democrats will and have acted in the past, The problem is that whatever is passed by democrats into law, is undone, the minute republicans are in a position to act. This was one of the main issues on Hillary Clinton’s platform. This problem of the NRA owning republicans is for real. See my 2nd answer. I answered your question without doing the research required to answer your question more correctly. Forgive me. There was a time where Dems fell down on the job. In 2005, there was legislation enacted barring victims of gun violence from being able to seek redress from the gun manufacture that 59 Dems supported along with Senator Bernie Sanders and bill Nelson of Florida. As per an Oct 2005 NYT report, The Republican-controlled Congress delivered a long-sought victory to the gun industry on Thursday when the House voted to shield firearms manufacturers and dealers from liability lawsuits. The bill now goes to President Bush, who has promised to sign it. In 2008-2009, Dems were working overtime to pass Obamacare when they should have taken steps as well, to extend the 1994 law banning the sale of assault weapons which expired in 2004 under President Bush. Today, Democrats would not get away with the vote they made in 2005 / or for their non-action in 2008-2009 but you are right, their hands are not as clean as they claim. One day the legislator and the current stance of the NRA will be called to account in a manner which will allow them no room to wriggle out. It is a simple fact which History teaches us; such excesses of violence and the myopic vision of the apologists for the cause cannot carry on without a massive reaction. What form that takes is hard to say. This will be when the Democrats take over. The Dems over time do not have cleans hands on this issue, but now, they would not dare NOT TO ACT. Then they will have done their republicans brothers and sisters a favor. The NRA has less of a hold once the bills are passed. The build-up of anguish seems similar to those of tectonic plates we read about in the earthquake process; at some stage there will be a reaction.